Christmas 2013: Patchwork ideas to brighten your home! Everyone loves a bright and well decorated house at Christmas time. This Christmas why not go for something a little different and add a bit of patchwork design into your home by taking inspiration from some of our Christmas patchwork ideas. Patchwork is created by pinning squares of material together and then sewing the pieces together. If you are only a beginner then keep designs simple but as you progress you can get very creative! You can pick up some lengths of festive themed material or use some scraps of material in festive colours such as red, green and gold and put together some lovely little pieces for around the home this Christmas. Patchwork has traditionally been used to create beautiful soft furnishings such as throws and cushion covers. 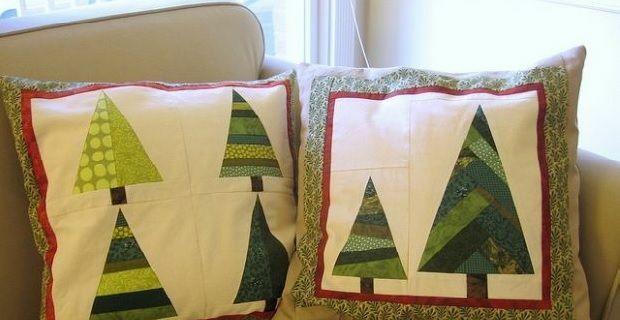 Sew your pieces or design onto a plain cushion cover and you have created a practical but seasonal addition to your couch. Many will be hosting Christmas dinner or otherwise entertaining over the holiday season and having a well presented table is a must. Add a bit of patchwork, while protecting your table, with eye catching patchwork table mats and table runners. At Christmas time the focal point of any house tends to be the Christmas tree. For just a couple of weeks a year we can lose ourselves in creating a masterpiece of Christmas decorations. Using some simple polystyrene such as simple ball, reindeer or Santa shapes you can easily cover them with some basic patchwork techniques and turn them into fun, original homemade decorations to brighten up your tree. Houses with kids are certain to want an attractive Christmas stocking hanging from the mantel piece this Christmas. Patchwork is ideal for creating original Christmas stockings. Santa is sure to be filling it up with lovely gifts. Once you have completed the Christmas look in your own home why not create a few extra pieces; one of the above or even something else such as a little reindeer wall hanging or a pretty patchwork Christmas tree which could make a really great Christmas gift. Do it yourself Christmas wreaths!